As a Wedding Specialist I see my main task as helping YOUR dream to happen! I am passionate about Weddings and do everything I can to help your Wedding Day go as smoothly and perfectly as possible. Whether you are having a Religious Service, Civil Ceremony or Civil Partnership, getting married abroad, if you are celebrating then I can help make the day and evening perfect! I provide a totally personalised service for YOU. Whether you just want the evening Disco or a full-day package I will help personalise the day to you, can offer support, help and planning advice if required and am always on hand to help in the run up to your special day as well as on the day itself. I can help with the timings, speeches (I can even supply a mini-PA system and radio mics for the speeches), suggestions on how to introduce your First Dance, your Official Exit and End of Night, I can help make your day go as smoothly as possible. I provide a Premium service, aimed at the discerning clients who want the very best service for their special day. I have also put together a range of additional services all designed to make your proceedings more effective, your venue more attractive and your memories more vivid! I do things differently to many other DJs. YOU are the star of the show, and my job is to help you give your guests a night that they will remember with great memories. The best nights are those where the guests leave still singing and dancing! I have entertained at Weddings for 20 people up to 400 people, and always use the most suitable equipment and style for the requirements of the event and the client. I am well-spoken with a clear, easily understood voice. I don’t dominate your event as many DJs do, instead I help and support you, and adapt my interaction to your requirements. With the level of pre-event contact to suit you, we can help to smooth out many of the worries you may have about your wedding celebrations. 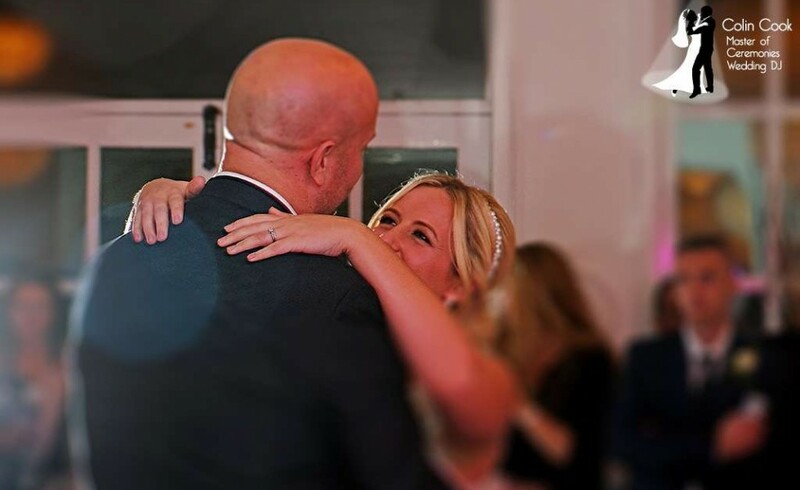 The level of service I give to my clients has quickly made Colin’s Disco one of the most popular Wedding Disco specialists in the North East, and a consistent recommendation from many prestigious venues. There is a lot of information on this page and I pride myself on customising exactly the service YOU want, so please browse through, call or e-mail, or why not take advantage of my no-obligation offer of a meeting to discuss your requirements. I can then prepare a detailed quotation for you. 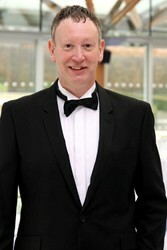 Why choose Colin as your Wedding DJ? Personal service, working for YOU, not your venue! Premium Service, second to none! Pre-event contact, design and interaction service to YOUR requirements! From subtle interaction to full-on MC* duties – YOUR choice! All Equipment Safety-tested (PAT), £10m Public Liability Insurance, Tax-registered, Wedding DJ Alliance approved Member (WDJA), South East Discotheque Association (SEDA) Member, Alliance of Mobile & Party DJs (ampDJ) Member – in other words, Professional, Reliable and Trustworthy! These include Bespoke HD Monogram Projection – your names in lights! LED ‘Mood Lighting’, Starcloth Background, Mini PA Hire, Ceremony Music and Voice Enhancement. I will do absolutely everything in my power to help ensure that you and your guests have the most amazing day ever! I will put 110% into every aspect of your wedding with which I am booked. I’ll help with planning, advice and suggestions and will commit totally to providing the very best service I can possibly provide. Your wedding is the most special day of your life, and you have planned it to the last detail. The Dress, Cake, Flowers, Location – everything has to be perfect on the day. Yet even after all this planning, many couples either leave the Disco till the last moment, or book the cheapest one they can find, regardless of quality, equipment or attitude. They then wonder why, after the excitement of the day, the ceremony and beauty, their guests leave feeling that they haven’t had the best possible time. You can rest assured that I will do all I can to help your Wedding Day run as successfully as possible! I provide a professional, reliable Wedding Disco, offering a quality service. Mobile Discos frequently gain a bad reputation due to unprofessional behaviour, poor reliability, messy, poorly maintained equipment, and ‘attitude’. I have built my reputation as a Specialist Wedding DJ by bringing to the Mobile Disco industry the same levels of service you would expect from top Wedding Suppliers . This attitude and attention to detail has not only delighted clients past and present, but also assures me of a warm welcome in venues across the North East. My wedding services are particularly welcome in such illustrious venues as Durham Castle, Alnwick Castle, Alnwick Garden, Middleton Lodge, Eslington Villa, Brinkburn Priory, Woodhill Hall, Ellingham Hall, Crook Hall & Gardens and many more. In fact wherever I perform, venues and clients comment on my totally professional attitude and great service! Some venues have a ‘Resident DJ’ whom they ‘sell on’ to their clients and this can be a big risk. Of course some Resident DJs are excellent, but why take that risk? Don’t be pushed into having who the venue want – it’s your wedding day – you should have that choice! Another benefit of choosing your own DJ is the chance to get to know each other beforehand, and share information and stories which can personalise the night totally to you. With Colin nothing is left to chance. Frequent pre-event contact, help with music choice, First Dance or Formal Exit, I will do all I can to help. With your Booking Pack is an Event Guide which helps you to set out the format for your evening, so that we get the timings right. I also supply a Wedding Checklist which keeps me informed of the timeline, important guests and anything else to make your night truly memorable. I have an excellent sound system, fantastic lighting and use smart silver truss. 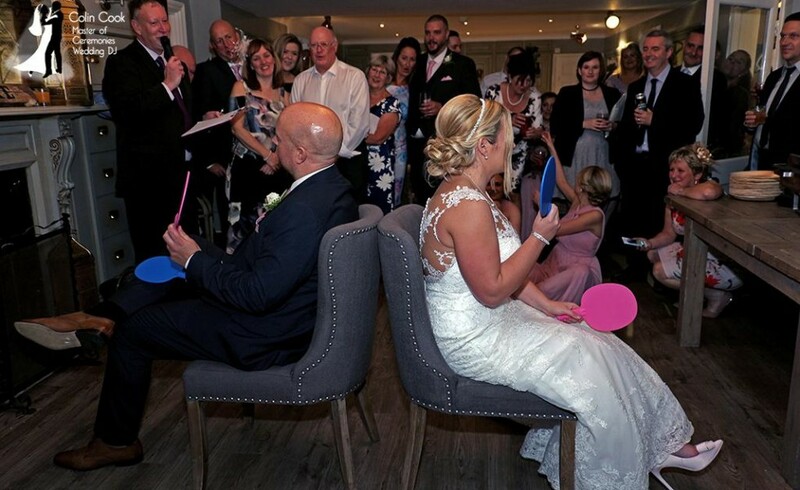 I take time to get to know my Brides and Grooms before the event wherever possible, and weddings are usually great fun and highly successful, as a browse though the Photo Gallery will show. 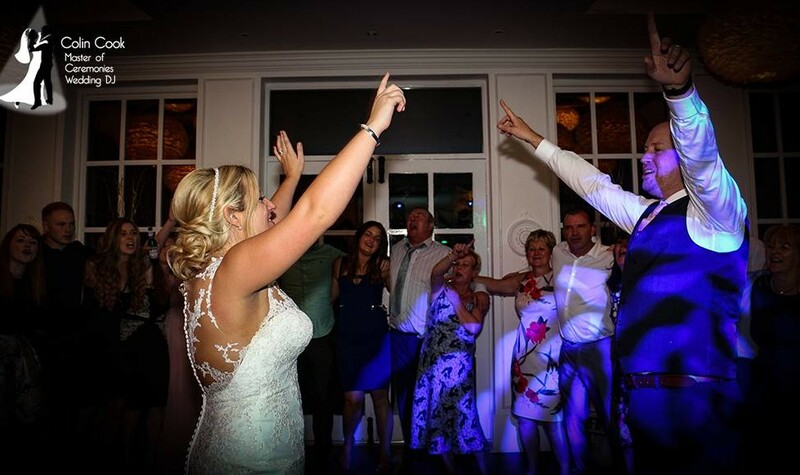 So whether its a full day affair, an evening Disco, or a small, select gathering I can provide the perfect choice of music, equipment and service to suit your needs. I enjoy participating in the more unusual weddings too. Recently I performed at a wedding for a lovely couple in Hatfield College, Durham University, where the music was heavily centred on Rock, Punk & Ska. The Bride & Groom had even practiced the ‘Twist Competition’ from the film ‘Pulp Fiction’ as their First Dance! Whether you want full on ‘American Style’ interaction with mini-bio introductions for all the Bridal Party, Master of Ceremony, or a discreet, laid-back style, I am happy to help make your dream happen. Many DJs have one setup which is used for every type of event. I have a wide range of equipment and decide on what is best to use at each individual venue, in conjunction with your dream. Although many clients want a standard Disco setup, I welcome your input, and more and more clients are opting for something a little different. Wherever possible I visit the venue in advance to introduce myself, leave copies of any paperwork (PAT & PLI etc) and ‘survey’ the room. I use the most appropriate equipment for each individual event. I am happy to discuss with you what YOU want. You can either leave it up to me, or provide your own input. Some clients want a very small, discreet lighting system, whilst others want a full on ‘club experience’. I always aim to please! Over the years I have developed a range of additional services all of which can contribute to making your Wedding Day the most unique, personalised and incredible day of your life. Please have a look around my site and if you have any questions or would like a quotation – get in touch! I cover the North East of England, including Durham, North Yorkshire, Teesside, Darlington, Northumberland, Tyne & Wear, Alnwick, Newcastle, Ripon, Thirsk, Middlesbrough, Sunderland, Yarm etc. I am happy to travel further afield for the right client, too. I am recommended supplier to Auckland Castle, Bamburgh Castle, Durham Castle, Alnwick Garden, Eslington Villa and several other fantastic venues. Quite simply – I listen to my clients, and do my very best to ensure that all of their needs are not just met – but exceeded. My Clients’ comments speak for themselves! My Wedding Services are specifically tailored to your specific needs, so please contact me to discuss your exact requirements and for a quotation. If you prefer I am happy to meet you to discuss your wedding entertainment and provide a price, with no obligation on your behalf. For those with all day events or requiring additional services please contact me and ask about my ‘Ultimate Wedding’ Package.